What is Bio Heaven ? BioBizz Bio Heaven improves the effects of all foliar sprays and fertilizers used to feed the plant. At the same time Bio·Heaven rids the plant of toxins, it repairs the chlorophyll production and restimulates the plant. By using Bio Heaven the plants’ energy will be increased! 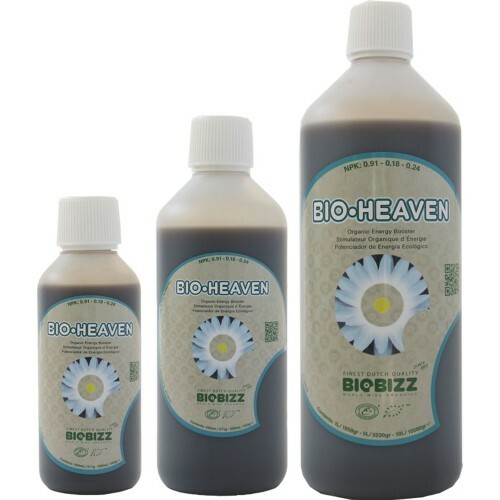 BioBizz Bio Heaven can be used during the entire grow and flowering period of the plant. Besides, it can be used on every substrate, on coco and in hydro systems. When using All Mix or Light Mix the most ideal dose is 2 to 5ml per litre water. Start with 2ml and slowly increase to 5ml. Follow our grow schedule for the best results. Bio Heaven is a specially formulated plant energy booster that contains carefully selected biological stimulants, such as amino-acids. Amino acids are the basic building blocks for proteins and enzymes, which are essential for the plants’ structure and metabolism. 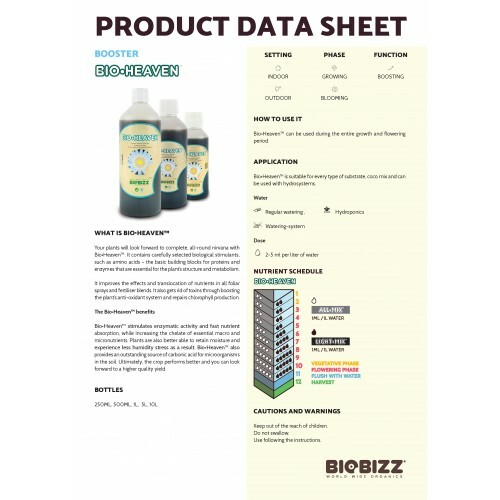 As a result, Bio Heaven enhances the utilization and translocation of nutrients in fertilizer blends and foliars and boosts the anti-oxidant system of the plant. By using Bio Heaven, a fast and complete absorption of important nutrients is stimulated. Bio Heaven makes the plant better keep humidity, which results in less humidity stress for the plant. Bio Heaven improves the performance and quality of the crop, as well as the harvest.